If Mega Man took place in the world of Lego, it'd be tough to kill robot masters as cute as these. 3D artist Raphael Phillips has returned for another round of Lego Mega Man goodness. Last time, he brought us the various forms of Mega Man as he used the abilites of various robot masters. 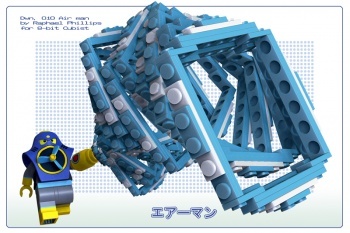 Now, he's modeled how Lego Mega Man's bosses would look before they get utterly destroyed by the blue bomber. 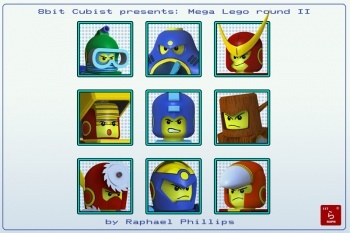 Phillips created the Lego robot masters for the 8-Bit Cubist, after being surprised by the overwhelming reception to his previous Mega Man work. He's worked on incredibly more complex 3D models, but his Mega Man art done on a whim was what ended up getting him the most attention. Though he jokingly says it made him "angry" at first, it taught him a lesson about what people will latch onto. There's just no explaining why videogame characters turned into Legos are so appealing. They just are. 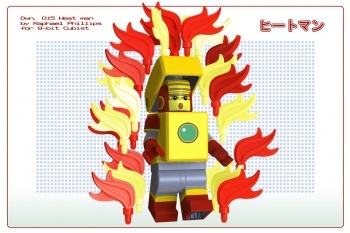 How can anyone look at this Lego version of Mega Man 2's Heat Man and not want to hang out with him all day (aside from the heat)? Phillips also created the rest of the bosses from Mega Man 2 in this latest batch, including Air Man, Bubble Man, Quick Man, Wood Man, Metal Man, Flash Man, and Crash Man. In addition, he modeled Mega Man on top of the various platforms he's given at certain points in the game, if they were made of Lego. The rest of the bosses can be found on the 8-Bit Cubist here. Someone needs to get Capcom and Lego game developer Traveler's Tales together so Lego Mega Man can become more than an awesome dream.